• Direct Victims: These are the individuals who were in the building during the event, those who are wounded, as well as the family of those who were killed. • Indirect Victims: First responders, friends of direct victims, neighbors and the community can all be considered indirect victims of the tragedy. • Hidden Victims: These are people that have experienced a similar tragedy or suffered a recent loss and the current tragedy has triggered memories and emotions from what they have experienced in the past. All of the above victims have and will continue to experience grief and loss in different stages. One of the most difficult phases of grief takes place once we are forced to get back to our everyday life. The full impact of loss can really be felt once everyone has gone home and we are left to pick up the pieces. 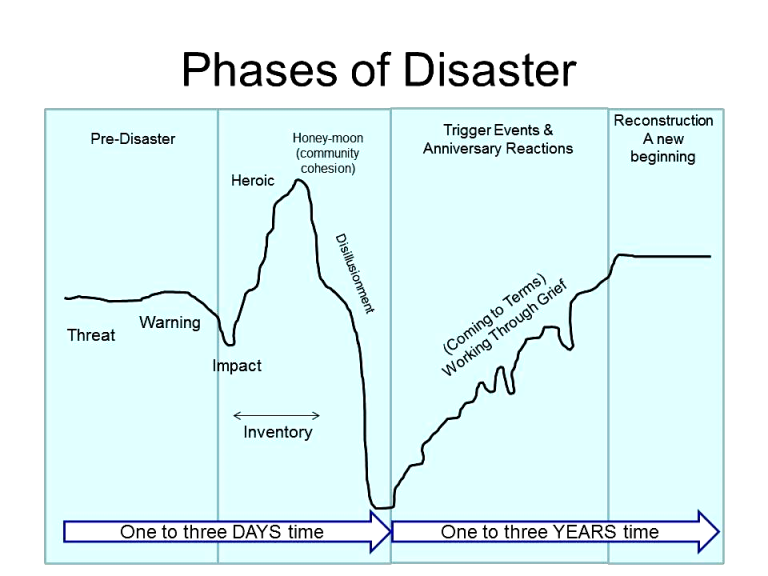 This graph is commonly used in grief and loss. It shows how it is not until several days or even weeks after the tragedy that our deepest pain and hurt are experienced. Immediately following a disaster we can have a time of cohesion, as we saw immediately following the tragedy in Orlando, that helps to ease our pain and lift our spirits. As reality begins to set in and we come to experience the impact of the loss the pain can become overwhelming. Grief is often described as coming in waves, that is why you see those dips in the graph as a person is working their way up to a new beginning. Through those waves individual will experience anger, depression, denial, bargaining and acceptance. These five stages will come and go in different orders and at different times. • Listen as those hurting share their stories over and over. • Create a safe environment for those who are angry to express their feelings without judgement. • Allow those who are healing the freedom to change and grow so that they can experience a new beginning as they seek to work through their grief and loss. This graph can also be a reminder of the hope we can have through our pain and loss. If you notice the starting point on the left is lower than the ending point on the right. We grow through disaster. We have and will continue come out of disaster with a new beginning and we will be stronger then when we started.